Enjoy the sportfishing adventure of a lifetime with one of the world's most distinguished captains! Book a Costa Rica fishing vacation with Captain Bobby McGuinness through Cazador Marlin Adventures and FishCostaRica. Captain Bobby McGuinness was twice chosen the world's top captain by the prestigious International Game Fish Association (IGFA). He collected the awards in 2006 and 2010. 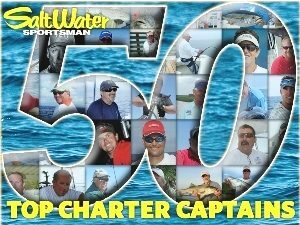 He was also named one of the world's 50 top saltwater sportfishing captains by the influential Saltwater Sportsman magazine. FishCostaRica invites you and your friends or family to fish with Captain Bobby McGuinness on his 37-foot Cazador. The South Pacific region offers what many consider to be the best offshore/inshore sportfishing combination in the entire country. 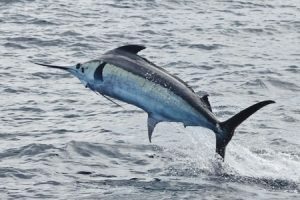 The offshore enthusiast can enjoy Marlin fishing in Costa Rica in spots that only Bobby knows about, and also go after Sailfish, Yellowfin Tuna, Wahoo and Dorado. CAPTAIN BOBBY McGUINNESS GUARANTEES YOU A MARLIN! If you book a two- or three-day overnighter on the Cazador between July 1 and November 15, Bobby McGuinness will guarantee you at least one solid Marlin hook-up. After that it's up to you to bring the fish successfully to the boat. This is a challenge that few captains would dare to offer, and too good a chance for anglers serious about catching a Marlin to pass up. Don't wait to call for more information. NEW!!! Bobby now has access to a comfortable 47ft Riviera Yacht for three-day, two-night and four-day, three-night trips to the FADs. Contact us for more information. For the inshore angler who craves lots of constant action, there are 12 Snapper species alone, including Red, Cubera, Rock and Dog-Tooth, plus huge Roosterfish, Grouper, Shark and Amberjack. Check out our 2017 season rates and fishing hours. For constant updates on what's happening in Costa Rica's wide sportfishing panorama, see our recent regular fishing updates on Facebook from the country's prime sportfishing destinations. In addition to those two top awards, Captain Bobby McGuinness has a long string of other IGFA credits to his name — he is an IGFA Ambassador captain, one of the very few to be so honored. 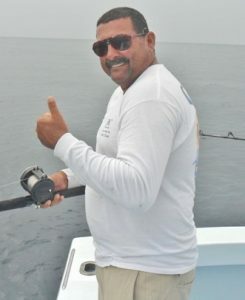 He made the IGFA's Top 10 list of guides and captains from around the world in 2008, tying for 5th place that year with 13 IGFA world fishing records. He also boasts an IGFA 3rd place certificate for 2009, and a 2nd place IGFA Saltwater Captain diploma for 2004. Bobby has set more world records than any captain fishing in Costa Rica. For example, in just two days in June 2009, he set an amazing 16 saltwater fishing world records! Fish for Marlin in Costa Rica with Captain Bobby McGuinness on his 37ft Cazador. For complete sportfishing packages with Bobby or elsewhere in Costa Rica, contact us. When you book with FishCostaRica to fish off Costa Rica's South Pacific coast, you can be certain you will be fishing with the top IGFA captains and boats in the country. Enjoy some of the best sportfishing anywhere. Bobby and his fellow top captains, like Cory Craig on the Hepcat and other excellent captains under the FishCostaRica umbrella, are dedicated to the preservation of the fish population and the sportfishing industry in Costa Rica; they promote the use of circle hooks which reduce the mortality rate by more than 95%. Bobby McGuinness is not only a superb saltwater sportfishing captain. He is also one of the nicest guys in the business, and a wonderful raconteur. 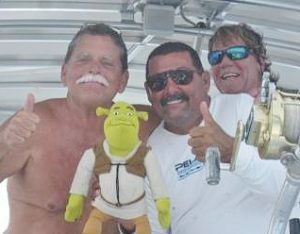 When not fishing on the boat, or sharing a beer with you after a charter, he will keep you duly entertained. Captains Bobby McGuinness and Cory Craig fish out of the towns of Golfito and Puerto Jiménez. Bobby is available for charter year-round; Cory between October and May. See what you can catch and when at our Costa Rica fishing seasons page, and see what others are catching by going to Costa Rica fishing news on Twitter. If you would like to fish in other areas like the North or Central Pacific coasts; out of Los Sueños Marina or Pez Vela Marina in Quepos; Tamarindo, Flamingo or the Papagayo Marina in the North Pacific; on the Caribbean side out of Tortuguero; or take an exiting, exotic trip across the Nicaraguan border to beautiful Rio Indio Lodge on the San Juan River, we have many excellent captains with whom you can fish. We have spent the past 25 years booking fishing charters everywhere in Costa Rica — Cazador Marlin Adventures/FishCostaRica is the most respected name in Costa Rica sportfishing today, with thousands of satisfied customers. Call us now toll-free. 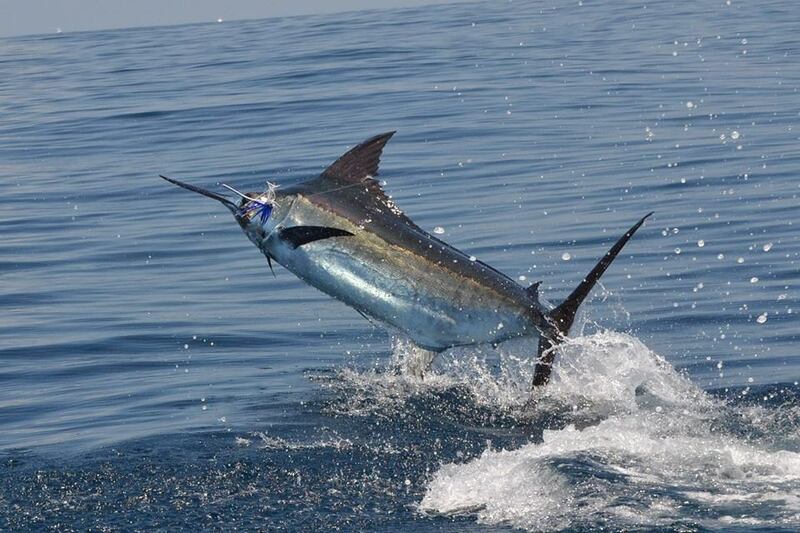 Contact Costa Rica Sportfishing now! BOOK YOUR 2017 OVERNIGHTER ON THE CAZADOR. Want to catch Marlin? Book your 2017 overnighter to the Sea Mounts/FADs. Experience all-day Marlin fishing action, combined with the magic of spending nights on the open sea. NEW!!! Bobby also has access to a 47ft Riviera Yacht for overnighters. Book an exciting three-day overnighter with Captain Bobby McGuinness on the Cazador or the Iron between July 1 and November 15, and he will GUARANTEE your group a solid Marlin hook-up. That is a challenge few captains would dare to make! Call 1-800-407-9438 or e-mail us now for more information. Don't miss this great opportunity.